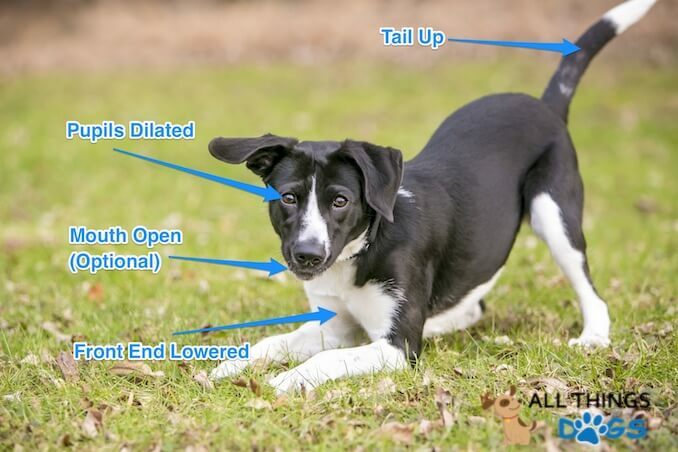 When it comes to understanding dog body language, despite the fact our dogs cannot talk, it doesn’t have to be difficult. However, there probably isn’t one day that passes where owners wish dogs could talk! There would be so many questions we would ask our dog: How they are feeling? Whether they do in fact like retrieving that tennis ball for the 600th time or are they just doing it to please us? Back to body language then, even without speaking, dogs do communicate, some more subtly than others. A dog’s body language tells us exactly how they are feeling, we just have to know what we are looking for. 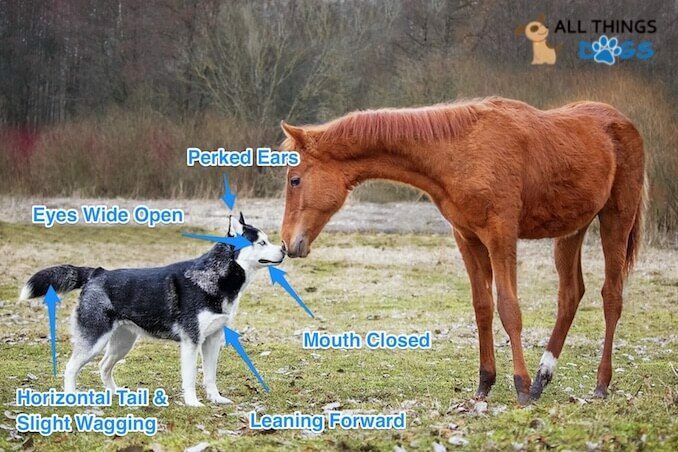 So to help you understand dog body language, we have put together seven real life examples to help you figure out what is going on in your four legged friend’s mind. 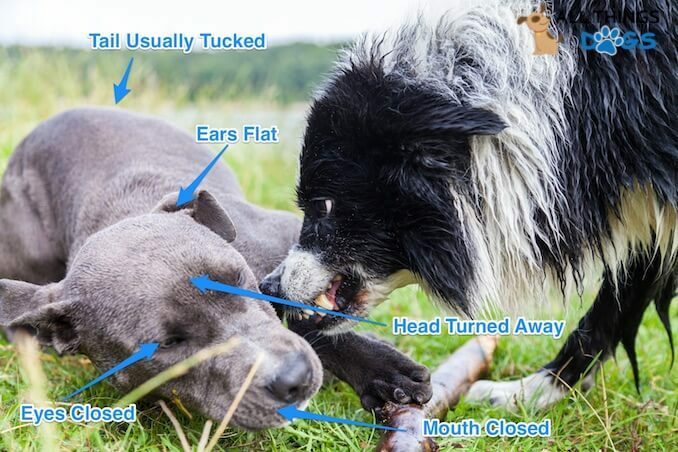 For those more adventurous, we also have a quick dog body language chart with a quiz to test your knowledge at the end! 1. Play Bow – I Want to Play! One of the most common signs of dog body language! The famous play bow. You’ve all seen it! Anyone who has raised a puppy will notice this immediately. Puppies will lower their front end and stick their bottom in the air. Their tail will be up, often wagging. Sociable puppies will do this to anything, a dog they meet and even the vacuum cleaner. They learn very quickly who reciprocates. The vacuum rarely does! They carry this behavior throughout their life – it is the universal “let’s play!” or “ready to chase?”. Some dogs will bark when they bow, this is usually a more high pitched bark, quick and snappy. 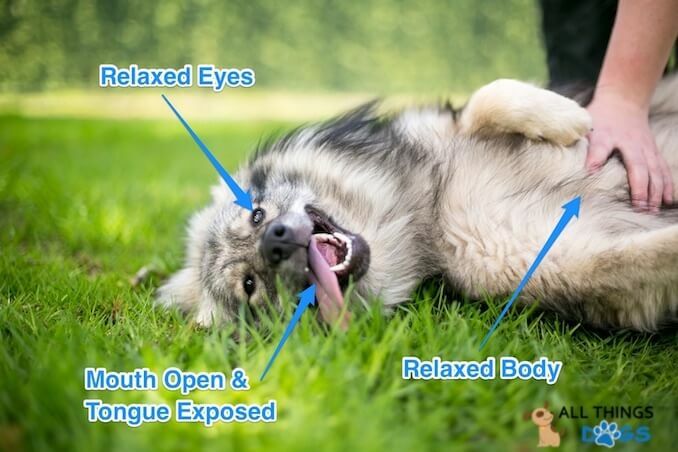 Some owners think when their dog rolls on the floor, they are being submissive, but understanding dog body language in this scenario requires a little bit more understanding. Dominance theory training has been widely debunked. When a dog rolls over, tongue lolling in their mouth, exposing their belly – you can bet your life, they actually just like having a belly rub. Their body will be relaxed, their mouth will be open, tongue likely hanging out. They will have relaxed eyes – they could be open or closed. Some dogs will sleep like this; you’ll see some incredible yoga poses from sleeping dogs! They trust that they are safe and are actually, just comfy. In this instance, he is not a happy dog. An aggressive dog will have his tail up. Their ears are perked and alert. He will likely be snarling and baring his teeth and his nose will be wrinkled. You will likely notice hackles on his back (by this we mean raised hair along his shoulders and down his spine). Some believe dogs do this to make themselves look bigger and therefore more threatening. But if we consider the stress response in humans, when we are facing a stressful situation, our brain turns on a plethora of actions in our body. This includes constricting the blood vessels in our skin. In an evolutionary sense, this was to reduce blood loss should an altercation occur. The constricted blood vessels cause our hair to stand on end. We wonder if this is what is happening in dogs too and in fact that’s why their “hackles are up!”. Interpreting dog body language in this picture is easy! This dog just wants to be left alone. A fearful dog may roll completely onto their back exposing their stomach and throat. They will usually turn their head away to avoid confrontation. Their ears will be flat and back. If they have a long tail, it will often be tucked between their legs. Many fearful dogs will close their eyes, again to avoid confrontation. They are hoping if they don’t get involved, or don’t respond, the aggressor will just leave them alone. The dog body language here indicates your dog is interested. This dog is very confident and very interested in his new friend or object. His tail will usually be horizontal and may wag slightly. You will notice that he is leaning in slightly to his new friend. His eyes are wide, to take all the information in. His ears are perked and alert. Despite being interested, his posture is relaxed and non threatening. 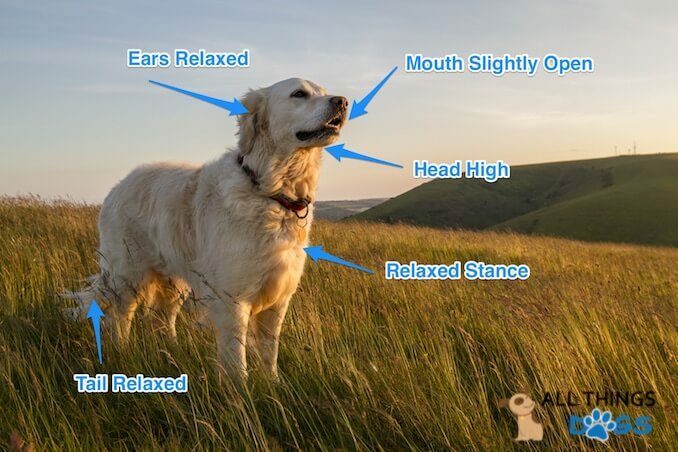 The relaxed and approachable dog will have a totally calm demeanour. Their head will be high, showing interest and they will move freely. Their tail may be up or down, depending on breed but it will sit naturally, not stiff. Their ears may be up or down, also depending on breed. A relaxed dog will usually have their mouth partly open, they may be panting, but not excessively. This is another scared dog, but still contemplating they may be able to escape the situation, slowly. Here you will notice they will be looking away, they may even close their eyes slightly. Their body will be lowered and they may be moving or walking very tentatively; some dogs will even raise a paw. Their ears will be flat and back; their mouth often closed. Their tail will be down, sometimes even tucked. Some dogs may attempt to very slowly wag their tail. Eyes A relaxed dog will have almond shaped eyes. They sometimes appear to squint at you. A stressed or fearful dog will usually have dilated pupils and the whites around their eyes will be on show. Fearful or worried dogs will tend to look away and avoid eye contact. Aggressive dogs will sometimes stare; if two dogs lock gaze intently, it rarely ends well. Mouth A happy, laid back dog will have a relaxed mouth. It will usually be open and they may pant. He may appear to smile. Stressed or fearful dogs will usually purse their lips and keep their mouths closed. 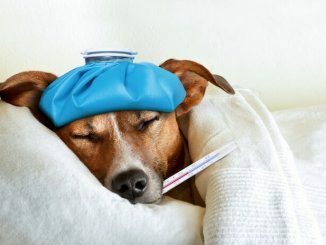 On the other side of the scale, a dog who is excessively panting when it’s not particularly hot or they haven’t been exercised is usually stressed. Drooling when there is no food present is also a sign of stress in dogs. In an aggressive dog, the mouth is usually the clear give away. They may curl their lip and wrinkle their muzzle. They may bare their teeth and snarl. You may hear a deep growl through clenched teeth! Ears In a relaxed dog, their ears will be in their natural state, whether this is up or down. It’s easier to read the ears of those dogs who typically have pointy ears. When they are stressed, they will lay flat and back. With floppy eared dogs it is still possible to read their ears, you just have to look at the base of their ear; you may notice movement. Movement forward shows interest, movement back shows stress or fear. Tail A stressed or fearful dog will tuck their tail in between their legs. They may wag it slightly, but very slowly. An aroused, interested or aggressive dog will raise their tail. This is where the rest of their body language comes in, to help you distinguish how they are feeling. Hair We mentioned their hair earlier on – you may notice hackles on an aggressive or fearful dog, you may notice that their tail fans out too. Stressed dogs also shed hair. 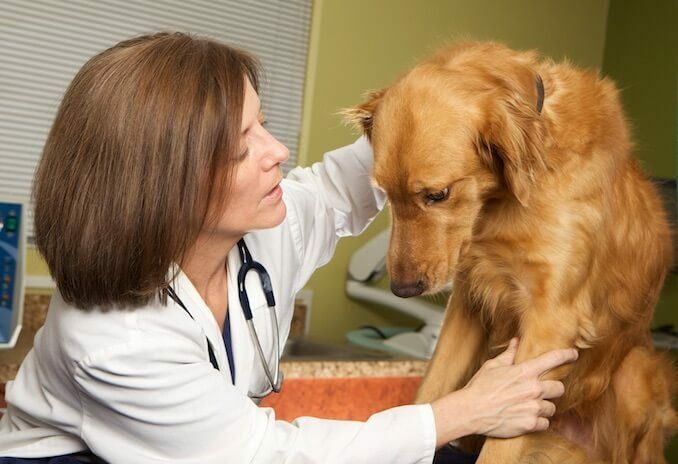 Many owners notice handfuls of hair coming out of their dog during their vet visit. Posture Watch your dog’s general posture – if it is stiff and upright, you can bet your life they’re not happy about something. If they are cowering away, making themselves smaller and walking tentatively they are pretty worried. Think you’ve got to grips with your dog’s body language? Let’s see. What do you think is going on in these photos below? If you’re not confident yet, re-read the dog body language chart above and try looking at the seven examples above. Q1 – What’s Happening Below? This would be the ideal scenario in the dog park. The dog on the right is interested, he has a horizontal tail and a relaxed posture despite leaning forward. 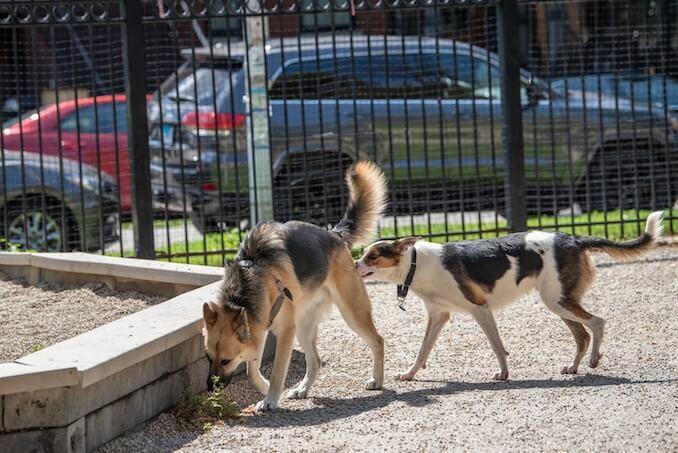 The dog on the left is quite happy being sniffed, he has relaxed posture; yet his tail is up, this could be to allow the other dog to sniff, or he himself could be sniffing something which interests him. Q2 – What’s Happening Below? You should immediately notice the fixed gaze between these two dogs. They are both pulling on their leashes. You will see the whites of their eyes are on show. Those eagle eyed readers will notice the ears on the dog on the left; the base of the ears are moving back, suggesting fear. This scenario is unlikely to end well. Owners should calmly distract and move these dogs away from each other. Q3 – What’s Happening Below? This may be a typical visit to the vets for some of you. This dog really doesn’t want to be there; his head is lowered and he is looking away. The whites of his eyes are on show and his mouth is pressed closed. Q4 – What’s Happening Below? At first glance you may see an aggressive dog. She is actually fearfully aggressive and asking to be left alone. She is remaining on the floor as she doesn’t really want confrontation. Her bared teeth are a warning that she just wants to be left alone. Her raised tail signals arousal and if the warning isn’t heeded, she may further protect herself. 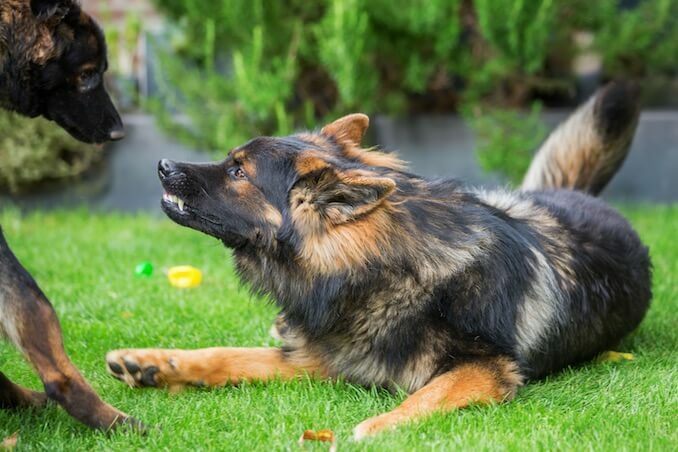 Owners who spend time understanding their dog’s body language put themselves in a much better position when socializing their dog and subsequently avoids potential disasters. 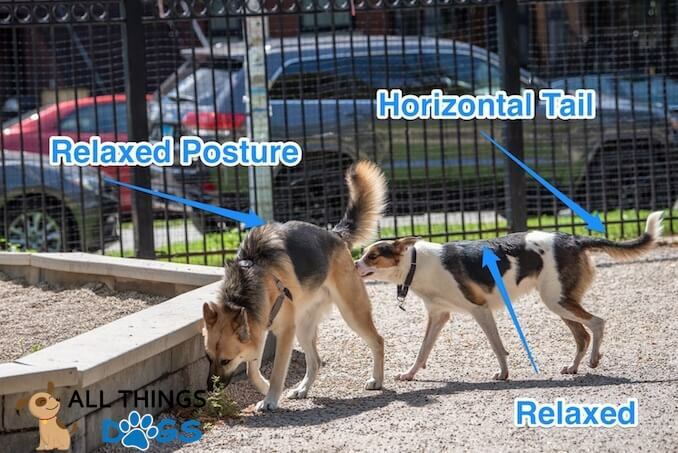 Understanding dog body language isn’t hard. If you notice the early signs that your dog is unhappy you can remove them from the situation, before it gets too much for them. We know that dogs learn best through positive reinforcement and reward based training. Flooding a dog with experiences so they get used to it rarely has a positive outcome. 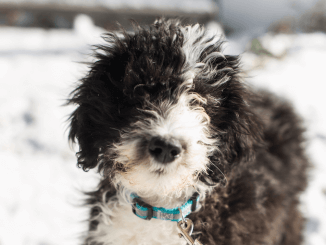 Noticing their little nuances and understanding their behavior enables us to raise a stable and well-rounded dog. 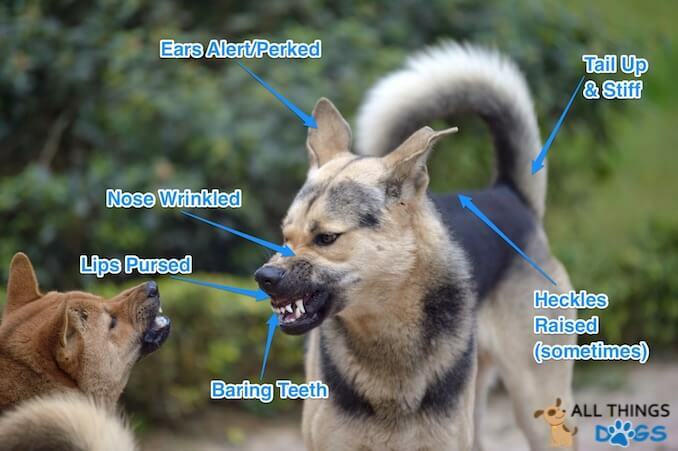 In equips us to avoid those less than friendly dogs in the park and ultimately lets our dog know that even though they can’t talk, we are trying our best to understand them. Has your dog been communicating with you lately? 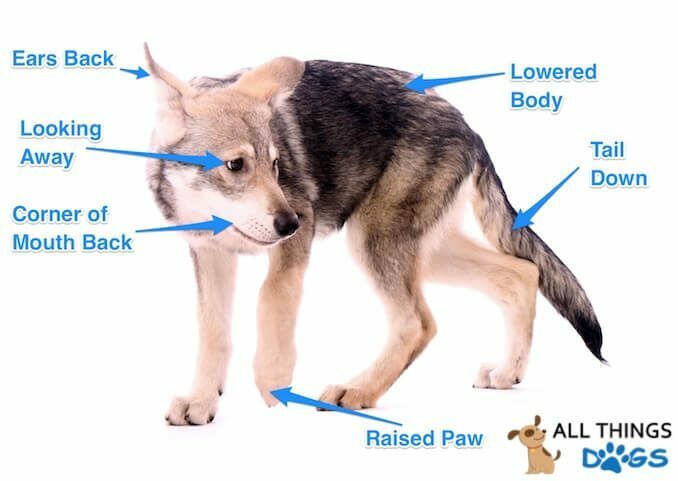 Is there any body language which your dog displays which isn’t listed above? Let us know below. Why does my dog licks his front paws a lot? This could be due to an allergy, anxiety, boredom or grooming. 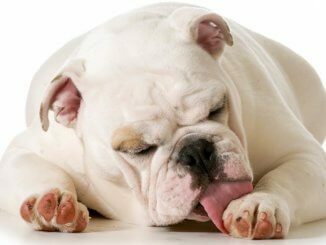 Feel free to read our article on 8 reasons dogs lick their paws. When my dog licks me, is he showing love? Hi Nancy, there are many reasons for why your dog might choose to lick you – it could be love. It might also be stress. You can read our full article on why dogs lick here.